We're cooking easy, comfort meals that don't take a lot of time in the kitchen this week. Last night's dinner was a perfect example, plus it featured one of my favorite treats as a kid, green fried tomatoes. Yes, that is a BLT, only the T is green, breaded and fried. Who knows if our tomatoes will ever ripen this year, so I might as well eat them while they are green. They get so wonderfully sweet when fried. That sweetness is the perfect foil to some good salty bacon. The tomatoes get sliced very thin then patted dry with a paper towel. Some people dip their tomatoes in egg before dredging in a flour mixture, but I find that makes for too heavy a coating. Instead I dipped mine in some buttermilk (well, I didn't have buttermilk on hand so actually I used half and half with a little lemon in it). I went very simple on the breading for the tomatoes as I wasn't eating them alone, just a mixture of 1/2 cup flour, 1 tablespoon cornmeal and some salt and pepper. Then, to make it even better I fried them in the bacon grease, oh yeah, the bacon grease. This is not a sandwich for the faint of heart. 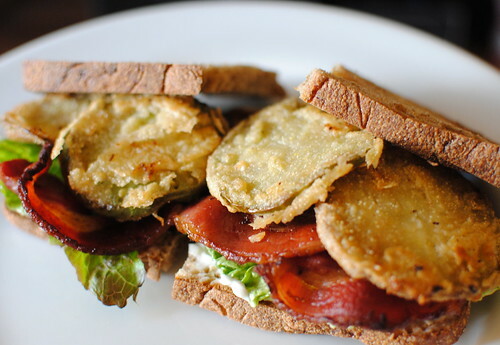 I made a fried green tomato BLT this past weekend as well. I prefer to use the egg dip and a spicy cornmeal breading for mine for some extra crunch over the peppered bacon. Just for fun I did a Tabasco ranch dressing on top as well. Gorgeous photo of yours. Mmm! Looks delicious! My tomatoes are refusing to ripen, this is perfect. brilliant! this is exactly what i want for lunch. Bacon grease makes it better! Considering some darned little critter keeps burrowing into my lovely tomatoes before they can fully ripen, I might just have to salvage some of my green tomatoes. And these sandwiches look, shall I say, awesome? one of the restaurants in my town serves what they call an ultimate blt, and it uses fried green tomatoes and challah bread. it really is pretty stellar! We have a deli here that does a Fried Green Tomato BLT, but I've never ordered it. I've been so tempted to make my own. Your tomatoes look great! Such a good combo!